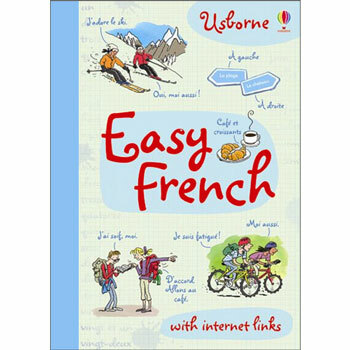 ​Usborne Easy French is an adventure story-based guide to learning French with clear, simple explanations for beginners. Fun and with bright illustrations, young learners can follow the story of The Camembert Treasure to see how the French language works in everyday situations. New grammar structures and vocabulary are introduced and explained clearly and taught step-by-step as this intriguing story progresses. Ideal for beginners and improvers alike, there are lots learning tips, a pronunciation guide and a French-English word list. Usborne Easy French is suitable for older children (Key Stage 3 / 11+) and adults. The grammatical structures taught within would take the reader to GCSE level and beyond. 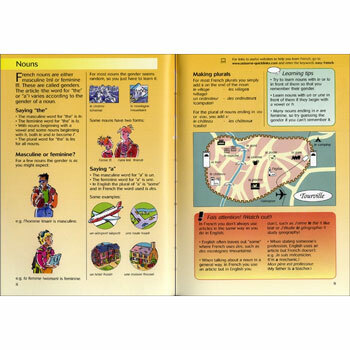 There is a full vocabulary list at the back of the book and there are various illustrated tables of verbs, grammar and vocabulary throughout.